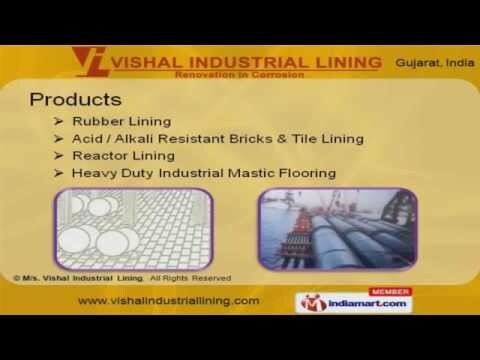 Welcome to Vishal Industrial Lining, Manufacturer and Exporter of Rubber Lined Products and Equipments. The company was established in the year 1982 at Ahmedabad. Our Technically sound infrastructure has helped us to earn clients across the globe. Cost effective market prices, Excellent after sales supports and expert professionals make us stand apart from also rans. Our quality assurance covers Resistance to Temperature and Dimensional Accuracy. We are specialized in manufacturing Rubber, Tile and Reactor Lining. Rubber Lining offered by us are best in the industry amongst others. Our Acid, Alkali Resistant Bricks and Tile Lining are extremely reliable. We also provide Reactor Lining that are widely acclaimed in the market. Along with that we offer Heavy Duty Industrial Mastic Flooring that are a class apart.